The medieval white fortified hill town walls of Ostuni, The White Town, Puglia. We were greeted by the sight of a man in an apron and wellies clutching a large wooden paddle. He scooped out large lumps of raw curd from a milk vat and sliced them into small pieces. These were transferred into a trough of boiling water, yeast and salt added, and stirred and kneaded using the paddle. It started off stringy but after more stirring and stretching it gradually coagulated until eventually our cheese-making friend skilfully squeezed out a ball of moist, silky mozzarella through his fist. he yellow whey leftovers would be used to make ricotta, while the secret of burrata, we discovered, is that it’s just fresh mozzarella filled with double cream. We tasted the results with hunks of Pugliese bread and local olive oil. Truly scrumptious. We’d travelled to Caseificio Lamapecora, a remote cheese farm, by bike from Masseria Torre Coccaro, near Fasano, on a gourmet cycle tour. The easy hour’s ride had taken us along quiet roads, through peaceful olive groves and past fields of parsley, chicory and cauliflower, and the occasional man repairing a dry stone wall. After a shaky start involving flight delays, rental car troubles and an unappetising first masseria (fortified farmhouses converted into hotels), our gourmet getaway in Puglia was finally hitting its stride. My partner and I had come for some late summer sun, to explore the Baroque towns, sample the renowned cuisine and learn something of how to cook it. Puglia, at the heel of Italy’s boot, was still warm enough – in late September – to sunbathe, provided you were sheltered from the wind and found a lido that was still open. The sea was still a pleasant temperature for swimming. 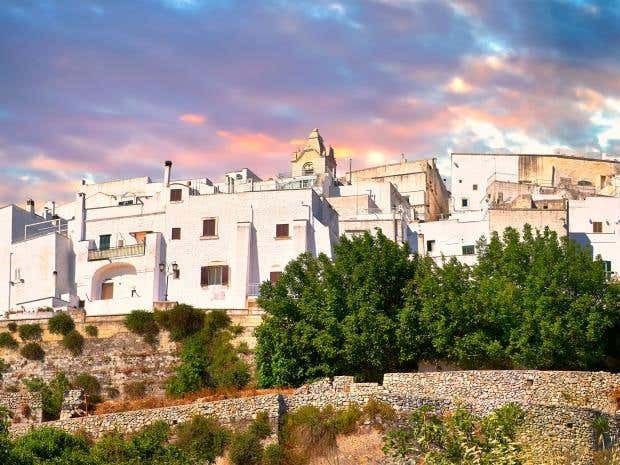 The whitewashed towns – notably Ostuni – were appealing once you’d penetrated their carbuncular suburbs. After our less than auspicious introduction to the region, our tour proper began at Borgo San Marco, a masseria on the outskirts of Fasano, a bustling town about an hour south of Bari. The Borgo has something of the Moroccan riad about it, the rooms set around a stone courtyard, while amid the grounds is a pool that blends perfectly with the bucolic surroundings. In among the lemon and olive groves are the remains of a medieval monks’ refuge with restored 12th-century frescos of Jesus and his disciples on the walls, while back in the main building is an atmospheric bar dominated by an old olive press and a terrace restaurant. The menu here changes daily; on our visit the highlights were antipasti of prawns, squid and mussels – which tasted as if they had passed the four-hour rule (from ocean to plate in less than that time), and homemade tagliatelle with a creamy seafood sauce. Searching for somewhere more lively for dinner one night, we did the tourist thing and drove half an hour to the Grotta Palazzese, at the end of a narrow street in Polignano. Descending six flights of steps from the hotel entrance, we emerged into a twinkly-lit cave-restaurant suspended over the sea. There was no need for piped music as the waves sloshed in and out below. It is an extraordinary location with extraordinary prices to match; the starters alone were €35. The lobster and zucchini ravioli was unspectacular, while the tagliatelle with lamb ragu and porcini was overpowered by truffle oil; despite the impressive setting, this isn’t the place for an authentic culinary experience. Our next stop was Masseria Torre Coccaro, which, along with its sister establishment, Masseria Torre Maizza, caters to well-heeled Europeans and Americans. These are posh hotels with all the amenities you’d expect, set on a large olive estate a mile from the sea. There are four restaurants between the two locations – a courtesy taxi ferries you between them, and also to the Coccaro Beach Club, five minutes down the road. As well as the bike tour, which turned out to be the highlight of our trip, twice a week the Masseria Torre Coccaro organises cookery courses, taught by their in-house chefs. We were shown how to roll and cut homemade pasta – spaghetti, ravioli, cavatelli (small shells), orrecchiette (ear-shaped), and the tubular tortiglioni – with delicate use of a knife and a skewer. We also learnt to prepare a pasta-puff – like a large soft samosa with a mozzarella and tomato filling. A chef demonstrated his enviable vegetable chopping skills – reassuringly crying as he sliced the onions – threw them all in a pot with a whole sea bass and some white wine, and left it to marinate. We ate the final product at the poolside restaurant an hour later – though to be honest we would have happily had another helping of pasta instead. The most interesting food, we found, was served in the most unlikely places. A simple taverna, La Veranda di Giselda, on the jetty overlooking the little harbour at San Vito, just north of Polignano, displayed its antipasti in a glass cabinet. The octopus in primitivo wine and the marinated aubergine alone were worth the trip – not to mention the fact the bill for five dishes and wine was only €30. On the opposite coast (the inside of the heel) at Santa Caterina was Barrueco, a casual bar-restaurant with tables sprawling along the promenade overlooking the rocky beach. The Neapolitans might have something to say about this, but my partner declared the pizza the best she’d ever eaten. We finished our culinary tour with a couple of nights near Ostuni, at Masseria Il Frantoio – one of the region’s original fortified farmhouses, set around a verdant courtyard and kitchen gardens. With its colossal door and high walls you could see how the community were able to protect themselves from 16th-century Turkish invaders. The interior, meanwhile, is like a Fifties movie set, with old books, posters of Greta Garbo and LPs playing on a gramophone. The speciality of the house is the eight-course, home-cooked dinner, made using ingredients grown on the farm There is just one sitting, which you have to book, and everyone dines together at large tables. We began with pizzette (small, gossamer-thin pizzas) followed by polpo – marinated octopus in a creamy green tomato and courgette sauce. A white aubergine parmigiana and a goat’s cheese soufflé were among the best of the remaining courses, each of which was complemented by a local wine. Olive oil liqueur and fennel dessert wine rounded off proceedings. Though our expectations of Puglian cuisine had perhaps been too high – and a couple of meals had disappointed – this was a banquet fit for a king … only without the royal bloating and indigestion afterwards. Simon Hughes flew from Gatwick to Bari with easyJet (0330 365 5000; easyjet.com). Long Travel (01694 722193; long-travel.co.uk) and Discovery Puglia (00 353 1 254 42 80; discoverypuglia.com) both offer breaks to Puglia. Masseria Torre Coccaro (00 39 080 482 93 10;masseriatorrecoccaro.com). Doubles from €284 (£196), B&B. Masseria Il Frantoio (00 39 0831 330276; masseriailfrantoio.it). Doubles from €110, B&B. Borgo San Marco (00 39 080 4395757; borgosanmarco.it). Suites from €160, B&B. Previous story WAS BEN TOO STOKED UP?